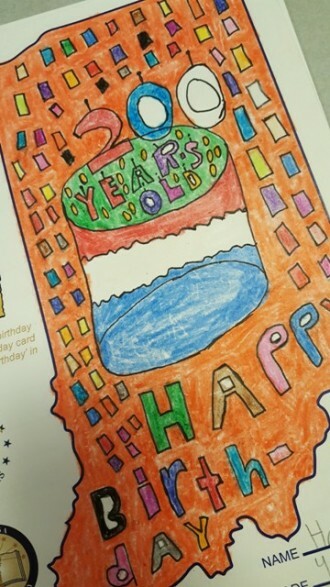 Did you know the Indiana State Library is sending birthday cards to 4th graders? We’re asking students from around the state to decorate special, acid-free cards while briefly explaining “Why do you love Indiana?” and “What does being a Hoosier mean to you?” Our goal is to preserve 10,000 cards for future generations. We hope you’re willing to take part in this historic project celebrating Indiana’s 200th birthday. If you’d like to participate, please contact Rare Books and Manuscripts Supervisor, Bethany Fiechter, at bfiechter@library.in.gov or (317) 234-8621. This entry was posted in Rare Books & Manuscripts, Uncategorized by indianastatelibrary. Bookmark the permalink.